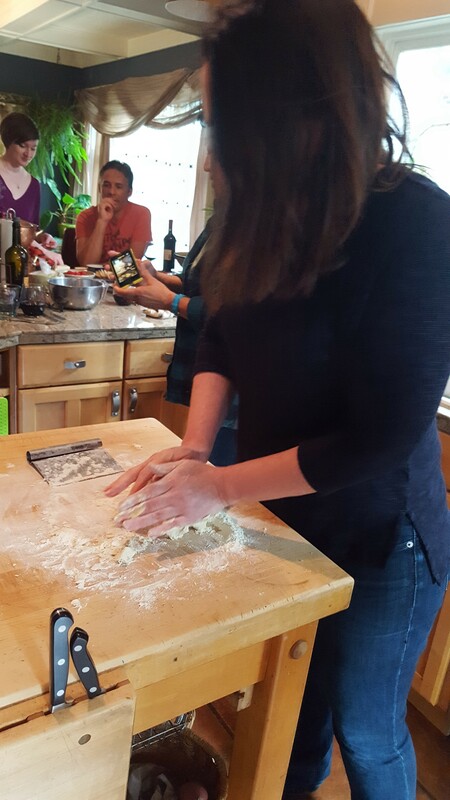 This Saturday some friends and I got together to make ravioli. We had the date planned long before we learned that Monday is international ravioli day, but that was a happy coincidence that made our plans even more relevant. Ravioli is a somewhat labor intensive meal, but with a great group of friends, some snacks and lots of wine, it becomes a party. In my time making pasta and ravioli, I’ve found lots of recipes and methods, so it’s always a bit of an experiment. I’ll share a few things that I’ve learned along the way that are helpful. First, use ‘oo’ flour. 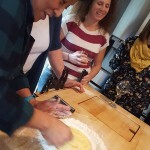 Semolina is fine for making other types of pasta, but doesn’t work for ravioli-trust me on this as I’ve had many sticky messes to verify that semolina does not work. Second, my new favorite pasta maker is the attachment to the Kitchen Aid stand mixer. I’ve had a hand pasta roller for years and they work just fine, but the party gave me an excuse to spring for the attachment and I LOVE it. Makes the whole thing much easier. And lastly, the method that you use to make ravioli may vary, but use egg wash to help the edges seal and you should be fine. 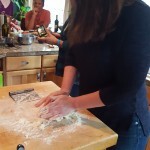 We all had our hands in the process and tried a ravioli mold as well as making it by hand and they all turned out well. Not one exploded! The recipes we used are below. Have fun! Make a mound of the flour on a counter or cutting board. Make a well in the center, keeping the flour walls high. Put the eggs in the middle, add a pinch of salt and break up with a fork. Mix the eggs fairly well and then use a circular motion to begin to incorporate the flour. Be careful not to break your flour “wall” and let the eggs run out…use your other hand to support the flour as needed. Keep stirring this way until the egg mix is quite thick and holds it form. Then use a scraper or your hands to bring in more and more of the flour. Knead until most of the flour is included, dipping your fingers in the water as needed to get the last bits of flour incorporated. Don’t use too much water! Knead until dough has come together and is fairly smooth. It doesn’t have to be perfect as the resting period will help a lot. Divide into 2 balls, wrap in plastic and set aside to rest for 30 minutes to an hour. Make the filling while it rests. Over moderate heat, melt the butter and oil. When hot, add the pork, onion and garlic. Cook until the onion is tender and there’s no pink on the pork. Add the wine to the pan and cook until it’s evaporated. Put pork mix into a food processor and pulse into ground fairly fine, but not a paste. Transfer to a bowl and let cool. Stir in the Parmesan, meat, salt and pepper to taste, and the nutmeg. Beat the egg and add. If this is your first time making ravioli, I suggest you look online at some pictures or videos as my directions won’t be thorough, but will describe our method. Take one of the balls of pasta dough and divide in half. 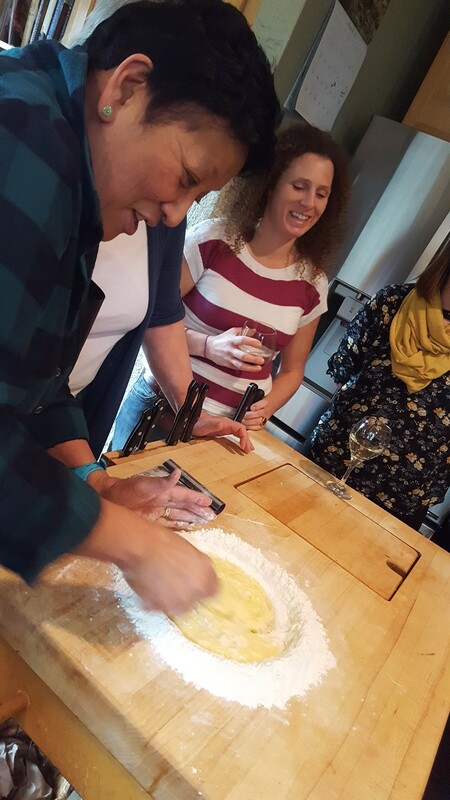 Put through your pasta roller on the smallest number first-this is the largest thickness and you should do this one a few times, folding your dough in half or thirds until it smooths out and has minimal streaks. Then proceed to put your strip through the roller, reducing the thickness each time until you’ve put it through the smallest one, which will be your largest number setting-either 6 or 8. Cut this long strip in half and lay the 2 strips side by side on your counter. Take 1 egg, whisk it a bit and use this as your egg wash. Find the center of your pasta strip and egg wash one half, not the longwise half, think two fat rectangles side by side-wash one rectangle. Put the filling in small teaspoon size portions in twos side by side on top of the egg wash side, with about 1/2-3/4″ between them. Take the short side of the non-washed side and fold over the filling, matching the ends. Press the long section between the fillings first, then between each filling, then end with the outside edges. The goal is to try and push as much air out so you don’t have air pockets with the filling. 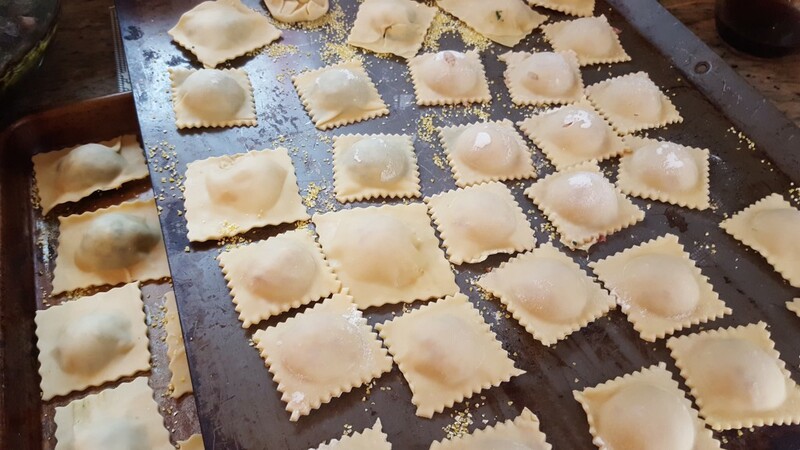 Trim and cut with a fluted roller or knife, place on a cookie sheet or tray that’s been dusted with semolina flour or cornmeal so the raviolis don’t stick and continue making ravioli till all are done. Make your sauce now-we made a brown butter, sage sauce. Melt a stick of butter in a pan until it begins to brown. Take off heat and let rest for 1 minute. Stir in sliced sage leaves or other herb you like, a squeeze of lemon juice and a little salt and pepper. Heat a pot of salted boiling water and cook for 3-4 minutes. Remove from pot with a slotted spoon, toss in sauce and serve immediately!